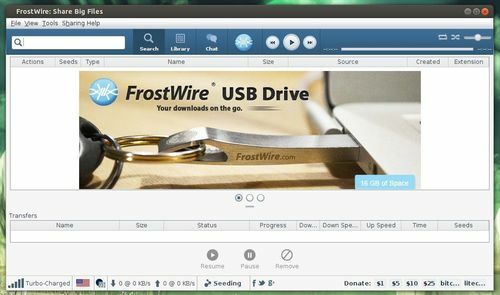 As you may know, FrostWire is a free and high quality BitTorrent client. The latest version 5.6.4 fixed a few bugs and updated translations. Fixes issues parsing some cloud urls. Fixes issues with soundcloud meta search. French translation updated. Thanks @jeromemorignot. Portuguese translation updated. Thanks @tati110. Brazilian Portuguese translation updated. Thanks @tati110. Arabic translation updated. Thanks @nisrmasr. Turkish translation updated. Thanks @Serrae. Interested? Here’s how to install or upgrade in Ubuntu 13.10, Ubuntu 13.04, Ubuntu 12.10, Ubuntu 12.04 and their derivatives. Then double click to install the Deb via pop-up Ubuntu Software Center.